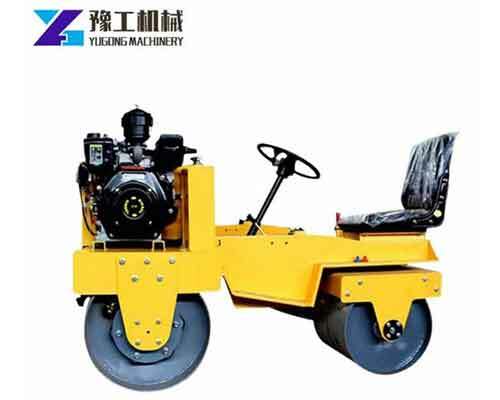 Trowel machine, also known as the names, power trowel for sale, concrete trowel machine, concrete trial machine, concrete finishing machine, power float machine, concrete helicopter and concrete smoother machine, is a kind of common road machinery that can make the surface of concrete pavement much smoother. 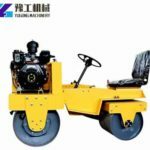 The power trowel can be widely used in the concrete surface slurry extraction, flattening and polishing of high-standard plant, warehouse, parking lot, squares, airports and framed buildings. 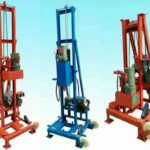 There are two types of trowel machine for sale in our factory, ride on trowel machine for sale and walk behind trowel machine for sale. 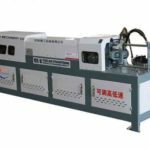 And the two models include several different sizes of machines, customers can choose the model they need based on the size of the project and the working efficiency. Pick up the equipment and send us email for quotation now. It is a kind of concrete surface rough, fine finishing tool which works much better and is more efficient. 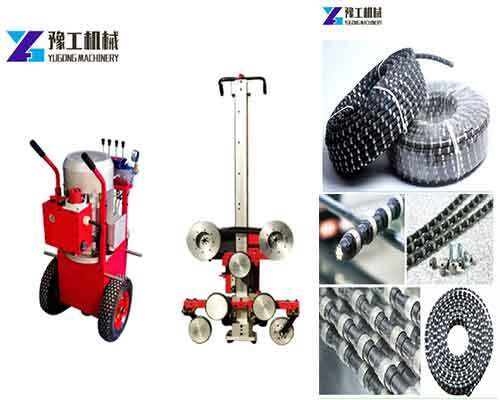 The concrete surface that is polished by concrete trowel machine will be much smoother and more even than artificial construction. 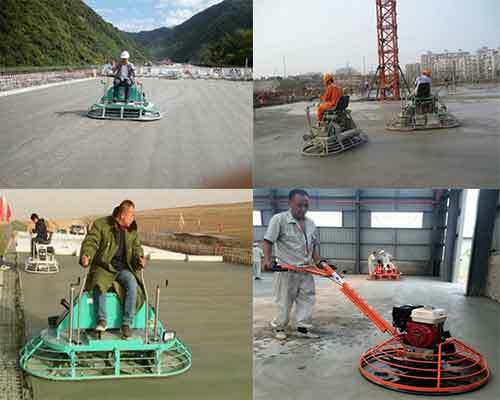 It can also greatly improve the compactness and abrasion resistance of concrete surface and its working efficiency is more than ten times higher than that of manual work. It is the indispensable equipment in construction equipment. 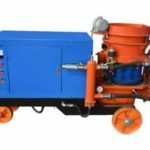 If you have the need to purchase concrete trowel machine for sale and some other types of road construction machinery,such as, thermoplastic and cold paint marking machine, floor shot blasting machine, floor scarifying machine, road rollers, etc… please feel free to contact us for more details. 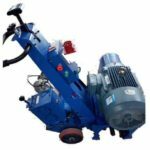 The concrete trowel machine can be divided into walk behind trowel machine and ride on trowel machine according to different operating ways. And the power can be electric and diesel engine. The diameter of the trowelling plates with 80mm, 900mm, 1000mm are the most type of the machine on the market. You can choose the suitable model depending on the working efficiency. 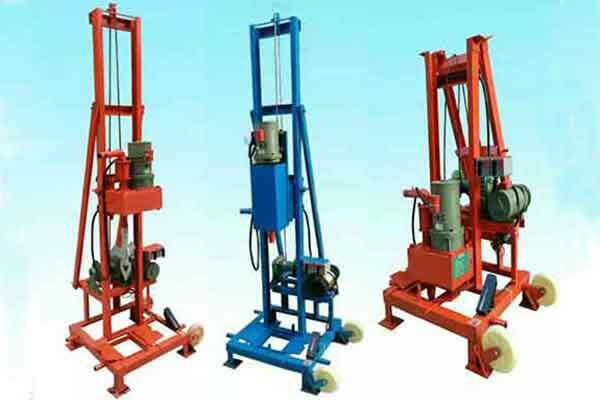 1.The driving operation can greatly reduce the labor intensity and improve work efficiency. 2.Two trowelling plates can be installed at the same time for rapid slurry extraction. 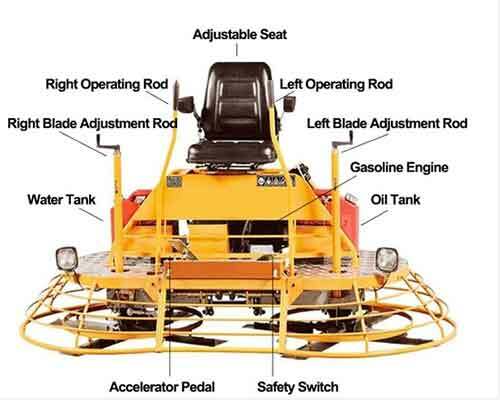 3.Double-sided ten blades, with a dead weight of 430kg makes it have better compaction effect on the ground. 4.Mechanical steering, the operating system is responsive which makes it easy and comfortable to operate. Meanwhile, it has variable gear. 5.High-grade trowelling plates that the speed can be up to 180 revolutions per minute, which makes the finish faster and the effect better. In addition, low speed can make the troweeling plates more powerful. 6.Be equipped with high-horsepower electric start engine that can provide strong and reliable power. 7.There is a safety cut-off switch which can shut down the engine quickly to ensure safety. 8.The control screw can adjust blade Angle. 9.Water spray projector system and lighting design can make construction more convenient. 10.The wheels can be lifted up and down, which makes it easy to walk. 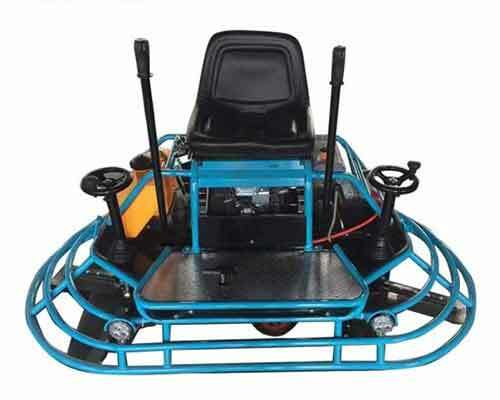 Compared with the ride on trowel machine, walk behind trowel machine may be a little laborious, but it’s still a very popular model. The machine is compact, flexible and easy to operate. The most important is that its work efficiency is dozens of times as much as the artificial finishing. In addition, the price is lower. So the walk behind trowel machine for sale is a good choice for some small projects. 1.First, clean the floor and ensure there is no standing water. Then brush approximately 2mm thick plain cement for bonding layer. 2.Second, pour the fine stone concrete onto the ground base of the well-brushed plain water mud. Spread it with a small square spatula, the spreading thickness should be limited to 15 to 20mm. 3.After scaling the fine stone concrete coating, the dry sand dust will be uniformly spread on the surface which is about 2mm thick. 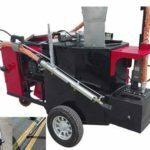 When the dry sand absorbs water in a humid state, operators can use the concrete finishing trowel machine to polish the ground. 4.In general, we need to use the trowel machine twice. In the process of the first polish, if there is no slurry or dry crack in some places, please sprinkle dry sand ash or a little water immediately. At the same time, the interior corner position should be assisted with artificial dressing corner. The second time, operators should move the machine from the room to the door slowly. This machine is mainly composed of moving handle, screw lifting, motor, worm gear box and smear assembly. It uses a unique startup method. The motor is decelerated by the three-stage gear, through two relatively rotating output shafts, respectively driving the relatively rotating double trowel. Under the action of mechanical gravity, the float is pressed to the ground to complete the compaction and polishing process. 1.Please check whether the motor, switch and cable meet the safety requirements before operation. And connect the cable zero line to the small box cover of the speed reducer box to prevent leakage of electricity. 2.After connecting the cable line, please turn over the power trowel machine to make the trowelling plate suspended. Then turn on the switch to check if the float is rotating in the right direction. 3.Check whether the bolts on the trowelling plate, safety cover and other parts are loose. 4.In order to ensure the flatness of the ground, operators should wear flat shoes. 5.After finishing the work, the residual mortar on the machine should be removed in time, and the connecting screw of the trowelling plate and the trowelling device should be wiped clean and coated with butter for protection.